I did this set of nails a few weeks back and all I could say is that her nail bed is really long and her nails are really pretty too! A sweet and relatively simple design. ♥ the length of her nails and nail bed. 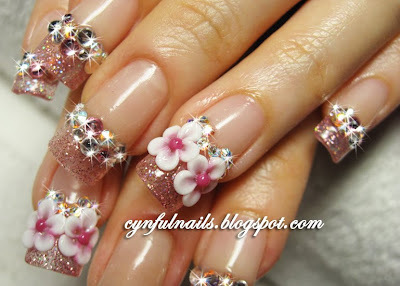 Nail extensions look exceptionally pretty on them. Not forgetting the tiny cute round flowers I did for her, and to make the flowers sharp and defined, it's not as easy as it seems to be. Took this pic from another angle. 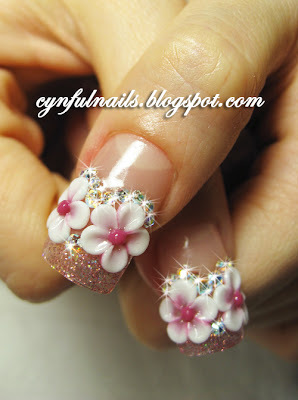 The dusty pink glitter, C curves and straight side walls can be seen more clearly here.